When people hear “the face of KCR,” they might think of KCR’s logo or the events KCR takes part in or puts on. But, members of KCR, some who have been around for years, probably think of General Manager Matt Hoffman and Programming Director Anthony Reclusado as the face of the organization. Members of KCR for nearly four years now, the roommates have held their management positions for half of that time and have greatly contributed to the radio station. I caught up with Matt and Anthony before their graduation for the last Behind the Mic of the spring semester. The pair made their debut on KCR in spring 2014 with “Delay of Game,” a show they have had on-air up to their final days as seniors. Anthony told me that during the fall semester of 2013, they contributed to “Aztec Circle,” a group sports show on KCR, because the two joined halfway through the semester and weren’t given their own time on-air. Since beginning “Delay of Game,” Anthony explained that they have localized their sports coverage to San Diego. Listeners would have heard nearly an hour of Padres, Chargers, Gulls and Aztecs coverage every week. Matt described a headline segment, “Quick Shots,” that concluded each show. During this short period, Matt and Anthony would bring up national sports headlines and break them down, giving their opinions. Prior to the move, each show began with the Chargers, with Aztec Football quickly following. Game recaps, injury reports and other player news all made up the usual discussions. “We shoot for quality and consistency — that’s why the show is still here seven semesters later,” Matt explained. Anthony added that dedication made their show stand out, with Matt giving an example of a basketball ticket giveaway they conducted on-air a few years ago, requiring the two to wake up at 4 a.m. to stand in line for the tickets. KCR has won an array of awards while Matt and Anthony have served on management. Photo by Amir Badeanlo. Matt has served as General Manager of KCR for two years, and prior to that (as a sophomore) he was Program Director. According to Matt, he spent the summer between management positions renovating the KCR studio. He collaborated with iHeartMedia to construct the current studio, which has professional equipment and safer furniture. “It all helps with the professionalism,” Anthony added. The following summer, Matt worked to open a second studio: the production studio in the basement of EBA. The culture of KCR has totally changed since their freshman year, according to both Anthony and Matt. “As soon as that studio changed, everything else changed,” added Anthony. “It’s a lot bigger than it probably has ever been,” said Matt, referencing the sheer size of KCR’s current membership. Matt described how amazing it is to see members of KCR, past and present, earn internships and obtain positions in the media industry, noting that KCR was the starting point for many. Getting people interested in radio has been one of Matt’s responsibilities. He mentioned current Production Director at KCR, Jack Sellas, as an example. Jack became an active member, obtained a management position and is now looking at radio as a potential career. “KCR will always be a part of my life,” said Anthony. Matt currently works as a news assistant at KPBS, where he also covers on-air stories. Additionally, Matt is a writer and producer for the morning shows at NBC 7 San Diego. After his upcoming graduation in May, Matt plans on working full-time at NBC. Anthony has worked with Matt as Program Director for two years. During his senior year, Anthony served as Sports Editor for The Daily Aztec. He currently interns at FOX 5 San Diego, and will move back to the Bay Area after graduation to continue his media career. Featured Image: Matt Hoffman and Anthony Reclusado are preparing for their graduation in May and departure from KCR. Photo by Amir Badeanlo. 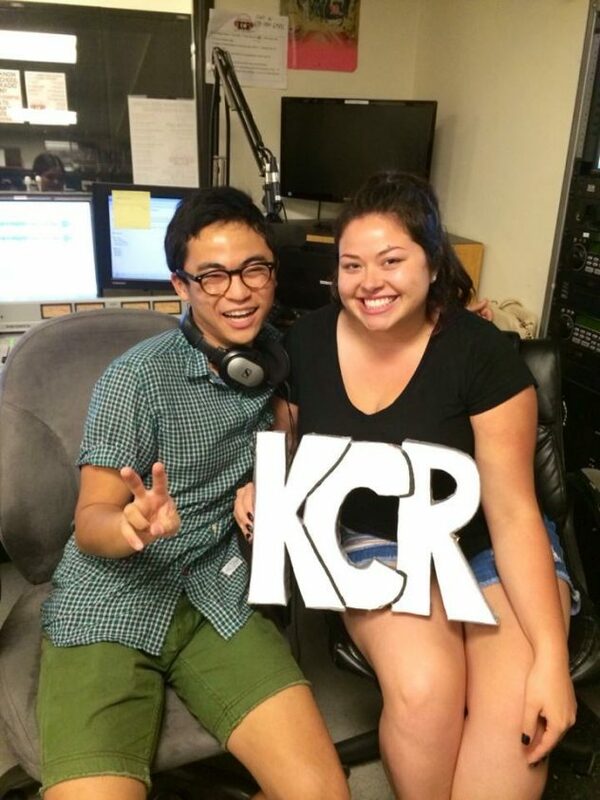 Listeners and fans of KCR College Radio know of the variety shows broadcast on-air. But, what some are not aware of is KCR’s coverage of Aztec Baseball. During the season, commentators, such as Brandon Battaglia, take to the airwaves from Tony Gwynn Stadium. I sat down with Brandon for a special edition of Behind the Mic. As a new member of KCR, Brandon went ahead and auditioned for baseball commentating at the beginning of this spring semester. First, Brandon was assigned to two games in the beginning of the season – and his performance warranted more appearances. Since then, Brandon has commentated nearly 10 games for KCR. To get a better understanding of what it’s like to commentate, I had Brandon walk me through a typical game. He and his partner, Sean Nichols, arrive to the stadium about an hour prior to the first pitch. During this time, statistics and information, including topics like “who’s gonna be big in the game” and “players’ backgrounds,” are gathered about the opposing team. Going into the commentating gig, Brandon told me he didn’t have many expectations. However, he now believes it will all work out. In addition to KCR’s live broadcast of baseball games, Brandon has begun covering games for the Mountain West Conference. According to Brandon, he got a call from KCR’s General Manager, Matt Hoffman, to fill in for a game. After a successful broadcast, Brandon and his partner Sean were signed on with the network for the remainder of the season. Brandon, an international security major, joined KCR in January 2017 as a sports talk show host for “Diamond Sports.” He and Michael Quinn host the show every Saturday at 2 p.m. They equally cover San Diego State teams and professional sports. During the season, the SDSU basketball team was the trending topic on each show. Brandon told me he addresses current player moves, playoffs and other headlines for the NBA and NFL. Brandon has hopes to resume commentating for both KCR and the Mountain West in the 2018 season. You can catch some of Brandon’s written commentary on Aztec baseball games, and listen to his show, on KCR’s website. For the other games, Brandon’s coverage can be viewed on the Mountain West website. In addition, you can find your favorite DJs on our KCR schedule. Featured Image: Brandon Battaglia, a sophomore at SDSU, is optimistic about his future in commentary. Photo by Sumner Shorey. Some of the best entertainment can come from the most natural and off-the-cuff conversations and reactions. Tony Berteaux’s and Daisy Santana’s “22 and Not Pregnant” does just that every Thursday at 7 p.m. Both hosts were able to join me for another edition of Behind the Mic. Tony created the show during his first semester at San Diego State nearly three and a half years ago. Daisy came on-board when the show was “18 and Not Pregnant,” and has been on air with each age iteration of the show since. During the show’s early days, the two covered trending reality television including such shows as “Honey BooBoo.” According to Daisy, the show has since developed into a general coverage of pop culture and “hot topics — whats going on in the news, whats going on with celebrities.” The two added that their personal lives and stories reach the air too. Tony pointed out there are recurring characters that have appeared on air and within stories including Teddy, Nick Santana and other friends of the hosts. Daisy said every week’s show is different, with either a mix of pop culture talk and personal stories, or one dominating the showtime over the other. Listeners can expect the show to be completely improvised and natural. Tony pointed out that the “uncensored nature” of the show is what makes “22 and Not Pregnant” unique for listeners. Food reviews are one of many featured segments that come on-air. Tony explained that he will buy something from the Aztec Market (not sponsored), eat it live on air and follow up with a review. Online quizzes, such as the ones on BuzzFeed, are also featured on-air, with the two hosts completing them together. Daisy told me the best part of hosting is, “bringing the creativity that’s in our minds and our personalities and putting that on-air.” Both hosts agreed their show is an hour to escape their lives and to let loose. Improvisation rules are an element of the discussions on-air, according to Tony. Despite the concentration on pop culture and their personal lives, the two do hold music breaks, usually with Tony’s picks. Indie and other “chill” music can be heard in between the hot topics. “22 and Not Pregnant” can be considered a legacy show at KCR. As seniors, both Tony and Daisy have busy lives outside of KCR. Daisy is President of PSFA Civil Core, the official service and volunteer organization of the College of Professional Studies and Fine Arts. She also works alongside the communications director of PSFA to manage the college’s social media. Daisy works as a student assistant in the Dean’s Office in PSFA. Tony is a Campus Editor for the Huffington Post. His writings focus on Asian-American representation and antisemitism. Tony also interns at the San Diego Union Tribune. 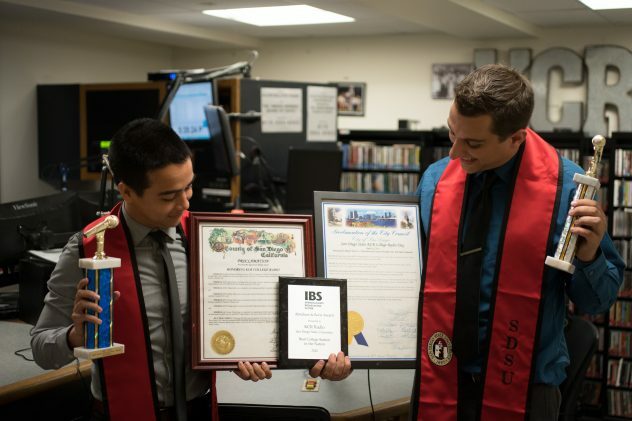 He manages the public relations for SDSU’s chapter of Society of Professional Journalists. Both Daisy and Tony are majoring in journalism and media studies. On an additional note, Tony let me know that he assisted in making current KCR General Manager, Matt Hoffman, who he is today. Years ago, Hoffman, who was not a KCR member at the time, approached Tony inquiring about the radio station. Unfortunately, “22 and Not Pregnant” has run its course and will be retired this semester with Tony’s graduation in May. “It would not be the same without the person who created it,” said Daisy. Daisy will continue on KCR with a new show in the spring of 2018, after she returns from studying in Belgium. Catch the remaining episodes of “22 and Not Pregnant” on KCR College Radio every Thursday from 7 p.m. to 8 p.m. Featured Image: Daisy and Tony’s friendship adds value to the entertainment they provide on-air. Tried-and-true radio shows usually have a history. Or, in other words, they’ve been around for a while; this includes the DJs and hosts themselves. KCR’s “In the Red” is an indie-alternative music show hosted by Alicia Hoole, Caitlin Catalina Cardenas and Nick Lograsso, who are currently in their fourth semester together as hosts. Curious about how they’ve stayed together for so long, I reached out for an interview for this edition of Behind the Mic. Each of the hosts indicated to me that they have unique tastes in music, which makes for a good mix on-air. That mix includes indie, alternative, classic rock, pop rock and punk rock. Regular listeners will know that every show ends with a pop song, whether it be Lady Gaga or the Jonas Brothers. Interestingly enough, Nick’s favorite Jonas brother is in fact Nick. Nick said that his music taste started with ’90s alternative, and that he still revisits the genre through his contributions to the show’s playlist. He did say, however, that he’s been influenced by both Caitlin’s and Alicia’s music taste – through genres such as classic rock, pop and 2000s alternative. Alicia added that Nick often plays unknown, but important and relevant, songs from well known artists and albums. Caitlin’s contributions to the show range from mid-2000s punk, such as Panic! and Fall Out Boy, to classic rock like The Beatles. Caitlin is a criminal justice major here at SDSU. Between songs, the trio chimes in with some music history about the songs they’re playing, as well as why the music made that week’s playlist. On a recent show, the hosts discussed The Doors and the 50th anniversary of the group’s debut album. In addition to history and importance of songs, the three bring up venues and shows they’ve recently attended or will attend. They’ll give a short review of the attended shows. Music for each episode of “In the Red” features separate playlists that Alicia, Caitlin and Nick compile themselves. Alicia told me playlists “reflect what each of us have been listening to during the week.” Listeners can expect to hear a new variety every show. When he isn’t a DJ, Nick is studying – he’s a computer science major. He also has a leadership role in Gates to Success, an on-campus organization that strives to help underrepresented and first-generation college students. The organization points students in the right direction for services like scholarships and tutoring. Nick is also a part of AITP @ SDSU, an organization of information, technology, business professionals. Alicia, a communications major, is the Music Submissions Director for KCR. She is also a member of Aztec Music Group, the on-campus organization focused on combining business and music interests. Last semester, Alicia interned at Topshelf Records in San Diego. She hopes to pursue a career in the music business. If you want to experience “In the Red” for yourself, tune in to KCR College Radio every Tuesday from 3 p.m. to 4 p.m. Featured Image: The three hope to add a segment to “In the Red” which focuses on a specific band, sometime in the future. Photo by Sumner Shorey.